If you’re worried about family slipping on the steps to your deck at night, these little lights can light the edges of each one. Then again they may end up stepping on the light itself and slipping anyway if they’re overly clumsy. 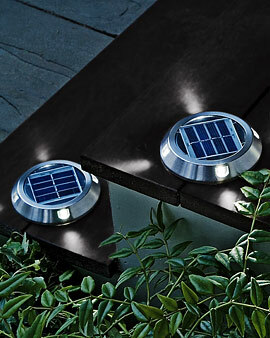 These small lights attach to the step and are solar powered. Each disk shines light in four different directions. However, hopefully you aren’t one that likes to have parties on your deck at all hours of the night. In that case after five hours these little guys will stop shining brightly. Which is great for those that want to sleep in the dark and try not to stay up late. The other down side is if there are enough cloudy days in a row you aren’t going to have much in the way of lighting. At least you can have cordless lights in a spot that is hard to add a few safety lights. Each light is sold for $24.95 or if you buy three or more you can snag them for $22.50. Which isn’t exactly a stellar deal, but if you have to buy several at once anyway, you can save a few dollars.